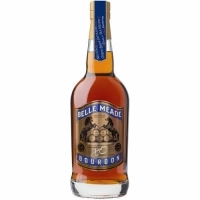 Cognac Cask Finished Belle Meade Bourbon is the result of painstaking attention to detail to create a product of unmistakable quality and character. Started by seeking the perfect casks for the project because like any other ingredient, the finishing cask must be exceptional in order to achieve exceptional results. The search ended when we found a selection of casks made of French Limousin Oak that had been used for 12 years to age one of the world's premiere Fine Champagne XO Cognacs. One smell of these casks told us that they held truly magnificent potential as finishing barrels for our Bourbon. We next selected the Bourbon best to fill these extraordinary casks. We decided on a blend of Bourbon ranging in age from 6-9 years to coax the best results from the casks. The younger barrels pair with the spice and fruit characteristics of the cask while the rich depth and complexity of the older barrels in the blend play perfectly with the soft, luxurious flavors of the well-aged Cognac that once inhabited this French oak. Belle Meade Bourbon Cognac Cask Finish has been cut to 90. 4 proof and, as with all of our products, is never chill-filtered. The result is a Bourbon of particular distinction and uncommon character. Have it neat, with a splash, over a sphere of ice, or create a distinguished twist on your favorite whiskey-based classic cocktail. However you drink it, you'll know you are enjoying a rare spirit made for the discerning whiskey drinker.